ABBOTT MOTORS, An exceptional car buying Experience, is offering this exceptional vehicle for sale. ABBOTT MOTORS has over 50 years of automotive experience! We are also a CARFAX Advantage Dealer. We offer great deals and specialize in FINANCING FOR EVERYONE-ALL CREDIT APPS ACCEPTED! We look forward to helping you purchase your next vehicle. CALL or TEXT (716) 229-5711 for quick answers to your questions about this vehicle. Your message will be answered by a real human never an automated system This Mercury includes: LEATHER & RENAISSANCE BURL WOOD STEERING WHEEL W/AUDIO Steering Wheel Audio Controls Leather Steering Wheel HEATED FRONT SEATS Heated Front Seat(s) LIGHT CAMEL, LEATHER SEAT TRIM Leather Seats Only the CARFAX Buyback Guarantee can offer you the comfort of knowing you made the right purchase. In addition to being well-cared for, this Mercury Grand Marquis has very low mileage making it a rare find. Added comfort with contemporary style is the leather interior to heighten the quality and craftsmanship for the Mercury Grand Marquis This Mercury Grand Marquis LS Premium w/Leather is in great condition both inside and out. No abnormal "wear and tear". A true feat of engineering, this Mercury Grand Marquis LS Premium has otherworldly acceleration, prodigious power and is accompanied by the prestigious reputation of Mercury. Although it may not make much sense, this vehicle will undoubtedly provide a memorable experience every time you drive it. You demand the best in everything, so why would your automobile be any different? 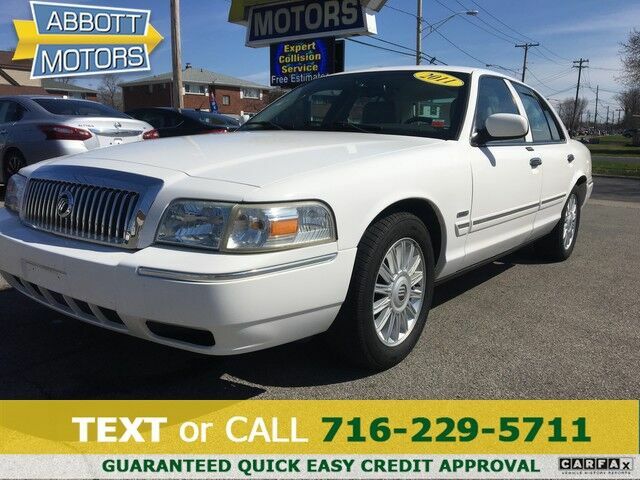 Enjoy the best features available in this stunning Mercury Grand Marquis. Winter, Spring, Autumn, or Summer...These tires can handle any season of the year. No matter if you're in the frigid cold of the Northeast or in the heat of the South, these tires can do their job. This Mercury Grand Marquis LS Premium was well-kept and pampered, which is evident by the flawless condition of its paint. This extraordinary find is a once-in-a-lifetime opportunity for someone who understands automotive magic. This Mercury Grand Marquis LS Premium has high-end wheels to enhance your ride and the overall appearance of this vehicle. More information about the 2011 Mercury Grand Marquis: The Mercury Grand Marquis is a classic large car design. It is rear-wheel drive, features a large trunk of 20.6 cubic feet and seats six via front and rear bench seats. Durability is the key value here--a venerable design, the Grand Marquis is built on a platform on which Ford builds the Police Interceptor and the LINCOLN Town Car. The model's standard 4.6L V8 has been a long-time powerplant in the Ford/Mercury fleet for many years, and makes 224 horsepower and 24 mpg on the highway. Interesting features of this model are cavernous interior that seats six, Comfortable and powerful ride, and enormous trunk STOP IN TODAY or Apply Online 24/7 at Abbottmotors.com ... All Trade-ins Welcome... Same Day Delivery... Call or Text Today and See The Difference... We Look Forward to Serving You! !This vehicle may be subject to potential open recall(s). Vehicle recall information may be found at Safecar.gov. Please verify price, equipment, options and features with your sales rep before your purchase. We Look Forward to Serving You. *Tax, title, plates extra. All Financing On Approved Credit. BBB accredited A+ member.